It was one of those Cactus League days with a breeze blowing and the ball flying out of the ballpark. Each team hit four home runs, with Dee Gordon, of all people, blasting two for the Mariners, while Daniel Vogelbach and Nelson Cruz each left the yard. Cruz, in fact, was on base all four times he came to the plate, with a single (after an 0-for-14 start to the Cactus League) and two walks in addition to the line-drive home run. So does Vogelbach, who has been the revelation of early spring so far. He hit the ball hard three times, getting two doubles as well as the homer. He is hitting .526 (10-for-19) with a 1.759 OPS. Mariners starter James Paxton, coming off a game in which he gave up seven hits and seven runs in 1 2/3 innings against Texas, worked three-plus innings and gave up five hits and four runs. His highlight was striking out the side – Austin Jackson, Hunter Pence and Andrew McCutchen – in the second. The Mariners had a lot of offense, but it’s hard to overlook Gordon, who hit two home runs in 653 at-bats last year for the Marlins and had two on Friday. Gordon has three this spring and can’t quite figure out where the pop is coming from. Actually, he can. But Servais believes it’s more than that. “He knows who he is. He said, ‘I’m good’ after the second one. I’m like, how do you not want to hit three? 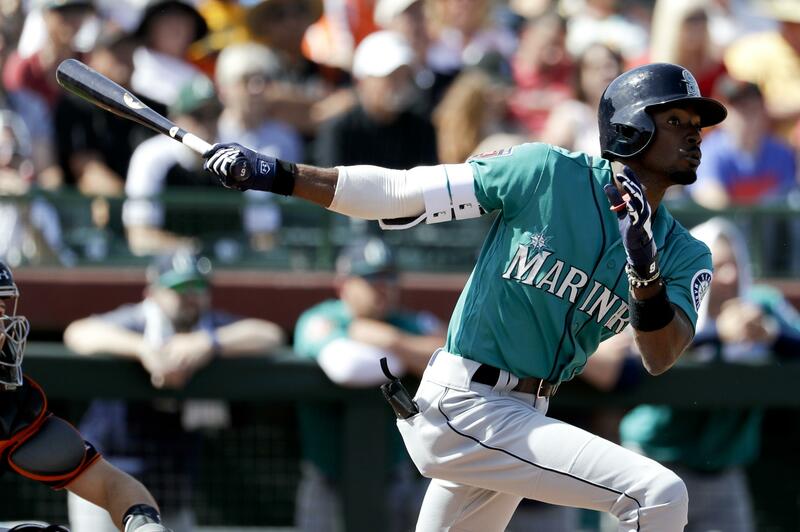 He said, ‘I’ve got to save them.’” – Servais on Dee Gordon, who came out of the game after his second homer. The Mariners have another night game on Saturday, this time in Goodyear against the Reds. Ariel Miranda will start for the Mariners, while Sal Romano, a 6-foot-5, 270-pound right-hander, starts for the Reds. First pitch is at 5:05 p.m. PT. The game will be broadcast live on mariners.com. Published: March 9, 2018, 5:11 p.m.